The accudxa2® Bone Mineral Density (BMD) Assessment System provides a quick, convenient, and economical measure for determining a patient's fracture risk. Though small in size, the accudxa2® is packed with sophisticated technology. Everything you need to quickly and confidently assess your patient's BMD is housed within the unit. The simple test can be performed right in your office and does not require the removal of garments or the application of messy gels or creams. The accudxa2® enables physicians to comply with National Osteoporosis Testing recommendations, and helps manage periodic osteoporosis screening for at-risk patients. Results are achieved utilizing super-accurate Dual X-ray Absorptiometry (DXA), the industry standard for BMD. The accudxa2® analyzes the finger, a site with over 50 years of clinical acceptance. accudxa2®'s low precision error (<1%) allows for the detection of changes over time. Scatter to the operator is only 1/15,000th of the weekly radiation exposure limit. Patient exposure is 0.0003 uSv or 1/150,000th of a typical chest x-ray. 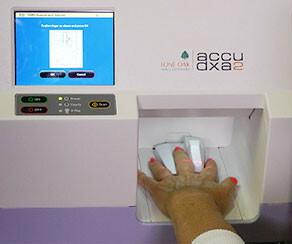 The accudxa2® is a highly affordable BMD assessment system. Medicare pays $28 – $30 (CPT code 77081) per test. Plus, most private insurance companies reimburse slightly more – giving you the potential for a quick return on investment. The ease of use and short test time of the accudxa2® will help attract new patients.